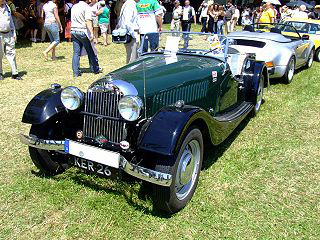 Morgan Plus 4 sports car. In 1947, the Standard Motor Company introduced a one engine policy in which they would be concentrating on the 2088 cc Standard Vanguard engine. The consequence of this was that, after 1949, the Special Standard 1267 cc engine, used in the Morgan 4-4, would cease to be available. In view of this pending setback, Morgan set about building a prototype 4-4 based on the addition of the 2.1 litre Vanguard engine. At first, Henry Morgan was uneasy about using an engine greater than 2 litres, but once he had experienced the unit's impressive torque, he was won over. The new model was designated the Morgan Plus Four sports car, and was duly launched in 1950 at the Earls Court Motor Show, and featured the 2.1 litre Standard engine which developed 68 bhp. Add four wheel Girling hydraulic drum brakes. The new sports car was an immediate success. In order to be allocated post-WW2 steel for manufacturing, Morgan had to export its sports cars, especially to the vital US market, and avoid the embarrassment of exported Morris Minors whose engine was so inadequate that the car could not surmount the hills of San Francisco. 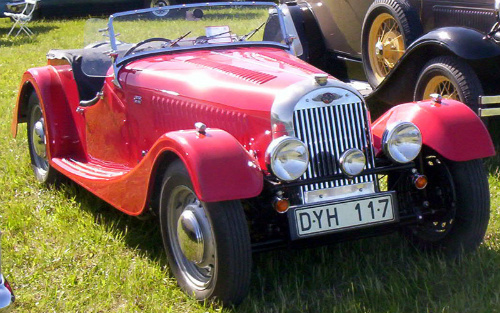 The Plus Four prototype was a drophead coupe, after which a two seater was built. Shortly after production had started, the first four seater was produced and entered in such competitions as the 1951 and 1952 RAC International Rally, in which it won the Team Prize. The two seater model was by far the most popular. With 893 of the three models produced up to that time, the two or four seat drophead coupe, which had wind up windows and a three position soft top, accounted for only 117 units, plus 141 units of the four seater, the remainder being the two seater. In terms of export to the US, the two seater and drophead coupe were most in demand. By 1953, sales of the Plus Four sports car were beginning to slow down due to the fact that the car was regarded as looking rather old fashioned, with its flat radiator. Furthermore, dealers were complaining that the model was becoming hard to sell. Since this facelift version turned out to be not ideal, it was upgraded a number of times during production. UK production featured the 2.1 litre Standard Vanguard engine, whilst the majority of exported cars were fitted with the 1991 cc Triumph TR2 unit, which offered improved performance. In 1956, the TR2 engine was replaced with that from the Triumph TR3, developing 100 bhp. When this model included lightweight aluminium body panels, it was not only fast, but capable of the standard quarter mile in 16 secs. In 1959, the Plus 4 received 11 inch Girling front disc brakes and knock-on wire wheels as optional extras, with the disc brakes becoming standard equipment a year later. In 1962, the TR3 engine was replaced by the 2138 cc Triumph TR4 unit. An interesting characteristic of the Plus 4 engine cowling was that, since it was such a close fit with the engine, it was not possible to fit an air filter, so some owners covered the carburettor with fine mesh material. On the race track, a Plus 4 won the 2 litre GT Class in the 1962 Le Mans 24 hour race, at an average speed of 94 mph. A 1957 Morgan Plus Four in excellent condition was realistically priced at £35,000/$57,000.